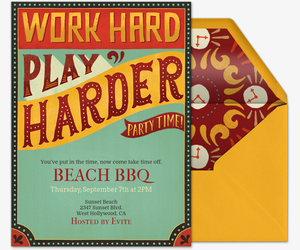 Plan one last hurrah for the summer season by hosting a Labor Day party with Evite. 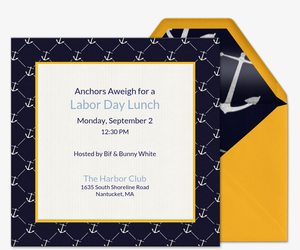 Browse dozens of free and Premium digital invitations featuring the September holiday’s themes, like sailing, barbecues, white attire, and patriotism. Whether you’re hosting at home, aboard the yacht, or by the pool, our collection has a design fit to kick off your Labor Day event. 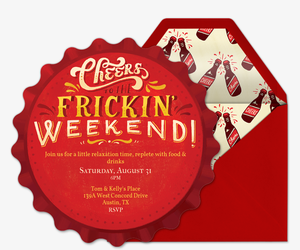 Our paperless invitations are easily customizable, so you can make your event as personal as you’d like. Fill in event details, provide a custom host message, and include requests for contributions in a “What to Bring” list. Then, encourage guests to post comments and photos before, during, and after the event -- and follow along on-the-go using our mobile app. Make Labor Day all about a cause by adding a charity of choice to your invitation, via the Evite Donations feature, powered by Pledgeling. 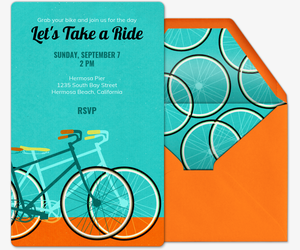 Guests can donate directly to a nonprofit on your online invitation page. 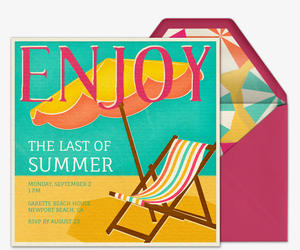 Do the summer send-off justice by sending a Premium invitation. Our ad-free Premium invitation option comes with matching envelopes, custom digital stamps, and optional inserts like photos and text cards. 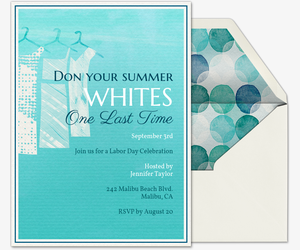 Or, upload an existing flyer or graphic onto one of our fully customizable design-your-own invitation templates. 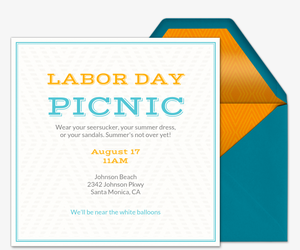 For creative Labor Day party ideas, visit Evite Party Ideas at ideas.evite.com. Check out patriotic picnic ideas, tablescape tips, recipes, DIYs, and more. 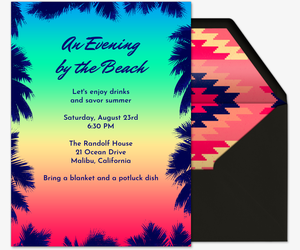 If you’re looking to plan a different summer event, check out our Memorial Day invitations, Fourth of July invitations, charity invitations, BBQ invitations, pool party invitations, beach party invitations, and more. Evite can help you celebrate your own milestones, too. Plan birthday parties, weddings, baby showers, engagement parties, and bridal showers with our invitations.